A recent storm near New Zealand triggered a high-surf advisory Monday as a formidable band of waves arrived on Southern California’s coast, the National Weather Service said. Before reaching the state, the storm churned up powerful swells and potent riptides since Thursday, pulling swimmers into — and under — the water from Chile to Mexico. The biggest surf was expected Monday and Tuesday, with waves as high as 15 feet at the Wedge in Newport Beach and sets as high as 6 feet at Zuma Beach. “It’s pretty booming,” said Los Angeles County Lifeguard Capt. 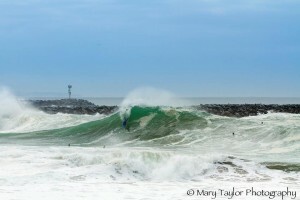 Kirk Thomas, adding that at its peak on Monday, Topanga Beach had about 90 surfers. Warm weather and unseasonably warm water brought more than 600,000 people to the shore from San Pedro to Zuma Beach this weekend, and county lifeguards rescued 64 people, said Capt. Kenichi Haskett. On Monday, Los Angeles lifeguards performed five rescues. The sight of large waves — which can sweep spectators off jetties — probably kept the number of rescues down, with crashing breakers making the risks of swimming very apparent, officials said. Farther south in Newport Beach, the Wedge traditionally generates some of the biggest surf in the region because of its south-facing beach, underwater topography and the nearby jetty that bounces waves back onto themselves. The waves there grow rapidly and crash close to shore, and they have been known to injure surfers, sometimes fatally. Newport Beach lifeguards — who patrol a fraction of the beaches of Orange County — rescued 20 people since Saturday, marine operations Assistant Chief Rob Williams told City News Service. The powerful swells are expected to subside by sundown Tuesday, ahead of a small storm that is forecast to bring light rain later this week in Orange, Los Angeles and Ventura counties. Sweet, the meteorologist, advised beachgoers to remain cautious. “Never turn your back to the ocean,” he said. WE ARE COACHES, INC. DOES NOT OWN THIS TEXT. Link for original content is above.